Custom photo notepads are becoming a hotter personal gift choice for individuals and businesses who wish to work on their goodwill. Be it a note for your dear one, a business reminder or a household reminder, scribbling down on a personalized photo notepad makes it more convincing and hearty, isn’t it? We offer a large selection of promotional photo notepads which can be utilized by advertisers, homemakers, students, individual businesses and everyone around who wishes to work on new relationships or mending the tethered relationships. Our designers will be happy to help out advertisers or any individuals who wish to spread bait their loved ones by giving visually enticing notepads. 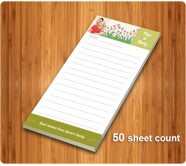 These notepads make a perfect gift choice during marketing events and can be utilized as a thanking favor during family events, school events and community events.